As a general rule we Whisky Waffle boys tend to be single malt snobs rather than blend bogans. As easy drinking as a blended Chivas 21yo is, we’d just as soon get to grips with a lively Balvenie 12yo single malt. However, one drop that we were lucky enough to try recently suggests that we just may not be drinking the right blends. Berry Bros and Rudd, better known for their vintaged Glenrothes range, put out a yearly blended malt release called the Blue Hanger. The bottling is named after Lord William Hanger, who was famous for his habitual striking blue attire (just like the blue Power Ranger. Here’s to you Billy!). The original release was a blend of specially selected casks from the Glenlivet and Glengrant distilleries. Eventually stocks ran out (hence the emergence of the Founders Reserve…) and now in this, the 9th edition, Berry Bros and Rudd have combined (like Megazord) 17yo Clynelish and 18yo Glen Elgin with both 23yo and peated 7yo Bunnahabhain. With such a pedigree it is no wonder the Blue Hanger claims to be the ‘collectors blended malt’. But is it worth adding to your own collection? Short answer: yes! But of course, this is Whisky Waffle, and so we will also supply you with a long answer too. The nose is light and fruity, and we were able to find strawberry jam, dried apples, quince paste, cured meats and Chardonnay wine. It’s essentially happy hour in a bottle. The taste is light but flavoursome. Under-ripe cherries, sherry and cola (NB: just a tasting note. No actual cola was brought anywhere near this baby. We’re not monsters you know) combine to sweetly dance across the tongue, followed by a gentle waft of cigar smoke. The finish is long, with the peat smoke slightly more prominent, and hints of pepper, burnt wood and gooey toffee apple. If you served this to us blind (as in blindfolded, not blind drunk), we would be unlikely to pick it as a blend. The high quality aged single malt elements that make up the Blue Hanger work together with delicacy and harmony to make a very enjoyable dram; the smoky, salty Bunnahabhain giving depth to the high notes of the Clynelish and Glen Elgin. If you tend to think that blends are beneath you, then like us, you’ve probably just been drinking the wrong ones. The world of whisky is a lexicological minefield, populated by distilleries and bottlings with all manner of weird and wonderful names. The birthplace of whisky in particular likes to play mind games with the innocent, wide-eyed bystander, the Scottish tongue bending words in ways you just wouldn’t expect. A true prince of the pack is a distillery from Islay with a name that causes the unprepared mind to melt at the sight of it. 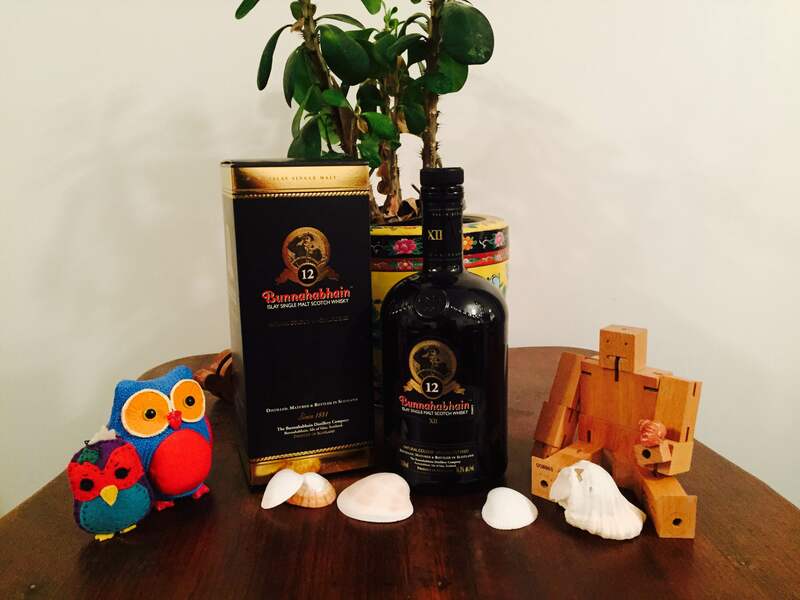 Gather your wits dear reader and say hello to Bunnahabhain (phew!). Right, so just to be clear, that’s BOO-na-HAVen (but to really get it, here’s a helping hand from Brian Cox). The Bunna, as it is more colloquially known, is one of the oldest distilleries on Islay, producing drams since 1881 in the village of the same name. Naturally, being from Islay means that Bunna drams are peated. Unlike other distilleries on the island, however, they aim for a far more subtle maritime nature, with the Bunna motto being ‘the gentle taste of Islay’. Encased within a heavy black glass bottle emblazoned with the sailor logo and the Roman numerals XII (a numbering system used for their aged releases), the Bunnahabhain 12yo is the core release of the distillery. Made with water from the Margadale spring and bottled at that sweet spot of 46.3%, the 12yo brings forth a rich golden hue. On the nose the 12yo is light, smooth, sweet and fruity, with ripe autumn apples, dates, plum jam, red grapes and raisins from the ex-sherry casking. Mixed in with the fruits are chestnuts, cashews, pistachios, dark chocolate, brine and rich oak. A veritable cornucopia indeed. On the palate the liquid hits sharp, salty and dry, like taking a mouthful of seawater on a summertime dip. Underneath sits salted caramel, ginger, mixed peel, seaweed and a faint hint of driftwood smoke. The finish is again salty, and lingers on the tongue like the end of a day at the seaside, a mixture of brine, sweat and sunscreen. Bunnahabhain is certainly not one of the Ileach peat monsters, choosing to keep that beast well chained in its cave. Instead it manages to sing an incredible song of its maritime environment, perfectly capturing the salt laden winds that blow in from the stormy Scottish coastal waters. The Bunnahabhain is indeed a whisky that is as complex in its nature as it is in its name.